In 1995, the Wall of Valor was dedicated as a part of military history to honor veterans of VFW Memorial Park Post 764, living and dead, for valor “above and beyond the call of duty” while in action against enemy forces. The plaques on the Wall recreate the deeds, medals, and heroic stories of these brave men who placed freedom above their own lives. This Wall serves as a token of our appreciation where symbols of their valor can be seen and respected for many generations to come. The Wall of Valor was designed by members of Post 764 who were eventually designated the Wall of Valor Committee: Richard Callender, James Morin and Daniel O’Neill. The Wall now holds plaques from three wars: World War II, Korea, and Vietnam. 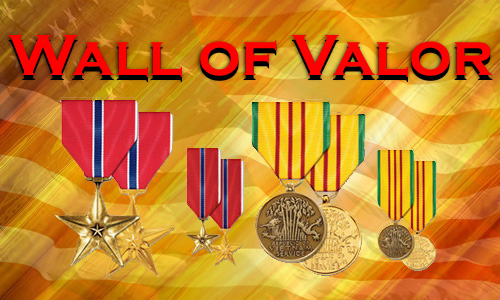 Those honored on the Wall are recipients of the Medal of Honor, Distinguished Service Cross, Navy Cross, Air Force Cross, Silver Star or Distinguished Flying Cross.